I recently attended a preserving workshop by the extension service and brought home a jar of this delicious jam. It definitely was a hit over warm sour cream biscuits. Just the difficulty of finding ripe mangos on the prairie but definitely worth the effort. In a deep saucepan, combine fruit and lemon juice. Whisk in pectin until dissolved. Bring to a boil and pour in all the sugar at once. Return to a rolling boil, stirring constantly and boil 1 minute. Remove from heat, skim off foam. Ladle into jars leaving a ¼ inch headspace. Process in hot water bath for 10 minutes. Actually sometimes fishing is what we wish we were doing come Spring Time. Spring is the busiest season on the ranch with calving, kidding, baby chicks, planting a garden, flowers, and trees. So Winter becomes the time for planning. Deciding on improvements we can afford for the ranch, ordering feed we cannot grow ourselves and ordering seeds and plants for the garden. You convince your spouse that an overnight, out-of-state trip for equipment parts is a vacation. You wear specific hats to farm sales, livestock auctions, customer appreciation suppers, and funerals. You have never thrown away a five-gallon bucket. You have used baling wire to attach a license plate. You have used a chain saw to remodel your house. You remember AUM’s and yields from 10 years ago but cannot remember your spouse’s birthday. You have driven off the road while examining your neighbor’s fields. You have borrowed gravel from the country road to fill potholes in your driveway. You have used a tractor front-end loader as scaffolding. You wave at every vehicle whether you know the driver or not. You always look when a vehicle passes your house, even at night. You refer to ranches by who owned them 50 years ago or more. You give directions to your ranch using landmarks, not road numbers. You know “Checkoff” is not a Russian diplomat. Your early morning prayer covers rain and cattle. Your ranch truck’s seat heater has four legs and a tail. Using the elevator involves a grain truck. You wake up when it’s dark and you go to bed after the evening news. You wear your boots to church. Family weddings and special events are planned around haying, gathering, and calving. The winter season is the slowdown time at the ranch. Yes, we still have our chores but things are not so hectic and we can stop and “smell the roses” so to speak. In the early months of every New Year, we stop and reflect on the happenings of the past year. Maybe, we are just reflecting because we are working on completing the book work for taxes. All kidding aside, this time of year causes us to count our blessings. Each year always has its struggles but the good times always outweigh the hard times. As always, living near the best neighbors around who are always willing to lend a helping hand without a moment of hesitation on any project. Our animals staying healthy and content in extreme drought and heat conditions. Our ranch being spared from devastating prairie fires. The land providing 98% of our food needs- we wish we could grow oranges and lemons and sugar cane in South Dakota but haven’t found a successful way yet. The support and help from our families in ways big and small. Answered prayers from the good Lord above. For our readers, What are some of the blessings in your life? George and I want to thank all of the buyers of our 2012 livestock, garden produce, and goat soap. Without all of you, we would not make a living off of our land. People’s positive comments make our day. Everyone inspires us to be the best stewards and caretakers of our land and livestock that we can be. We always welcome visitors to the ranch and can provide a home-cooked meal and comfortable place to rest. A second Savanna buck was purchased from Kenneth Mincey. He has been dubbed Stonewall after the famous Confederate general Stonewall Jackson and it is fitting since he was born in Georgia. The plan is to have him breed our does that were sired by our first herd buck, Ice-Man. It will be exciting to see the combination of genetics in the Spring. Meet, Magnum, our new herd bull. Magnum is a registered Hereford bull JR CCF DEEN 434V 1105 with a 5 frame size and comes a line of Dam and Sire Distinction. He weighed 83 lbs at birth and will be a good addition to our herd! Posted here are photos of our 2012 crop of Savanna bucks that we have for sale. Enjoy! The blog has been silent due to the beehive of activity on the ranch. Calving and kidding kept us on our toes in the early Spring. Now we are onto handling livestock in drought situations and being prepared for prairie fires. The gardens are producing well. Fencing, repairing stock dams and buildings are daily activities. We have butchered and sold our first batch of pastured broilers and now have half-grown chickens with our second batch of broilers. We consider ourselves lucky to stay busy with Nature’s bounty and enjoy the challenge that Life brings our way living on the prairie. Summer is the time for picking fruit of the prairie. 2012 has proven to be an excellent chokecherry and currant year. 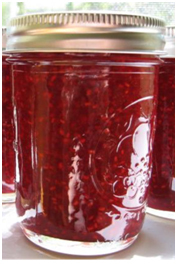 Here are a couple of my favorite recipes for currant jelly and chokecherry syrup. Pour black currant juice into a 6 or 8 quart kettle. If short of juice, fill last cup with water to equal exact amount of juice. Add lemon juice. Add pectin to juice in kettle; stir well. Place over high heat and bring to a boil, stirring constantly. Add the sugar, mix well. Continue stirring and bring to a full rolling boil. Boil hard for 2 minutes, remove from heat. Pour into sterile 1/2 pint jars, leaving 1/8 inch headspace. Hot water bath for 5 minutes. Makes 7 half pint jelly jars. Pour the chokecherry juice in a large kettle. Next add sugar. Cook on high stirring constantly. Bring to a rolling boil and boil hard for 1 minute. Remove from heat and skim foam. Add almond extract. Pour into sterile pint jars, leaving 1/8 inch headspace. Hot water bath for 10 minutes. Makes 3-4 pint jars. Great for making milkshakes or over pancakes.